ROLLING SHOOTING RANGE: The Raven has built-in wheels and a pull handle for easy carry and storage. It throw can throw clays 50-80 yards with a 2.5 second recycle time. PROFESSIONAL GRADE MATERIALS: Arm made of aircraft aluminum with a 5 -35 degree angle of adjustment allowing for different throwing planes. Our silky smooth feeder tray provides a flawless transfer of pigeon onto the throwing arm by loading directly to the throwing arm. The Raven has a durable textured matte finish. SAFE & ADJUSTABLE OPERATIONS: Safety pin ensures that the arm does not fire in an accidental release. 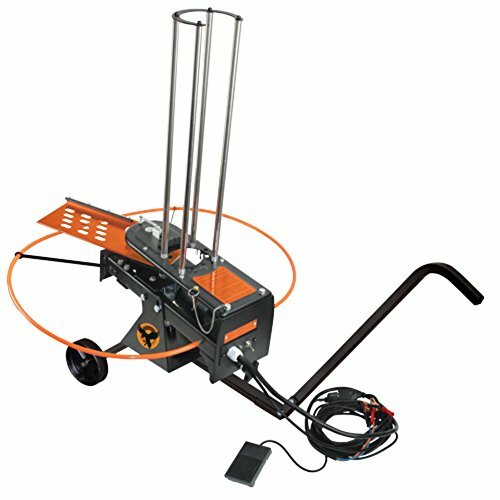 It features an attachable safety ring guard and a food pedal release with 25 foot cord with an adjustable limit switch for timing adjustments in the field. FUN & EASY ONE MAN OPERATION: The Raven will provide you a rolling shooting range that makes one man operation fun and easy while expertly launching your standard or bio clays. It handles all standard, bio's, 108mm, and 110mm clays. AMP UP YOUR SKILLS: Providing a great way to practice your duck hunting skills off season, The Raven runs off a 12V deep cycle marine battery (not included), is compatible with the Do-All Outdoors wireless remote and Wobbler, and features a low battery indicator light and On/OFF/RELEASE switch.